Coachella music festival took place over the weekend at Indio, California kicking off the festival season. Likes of Rihanna, Kate Perry, Kate Bosworth, Fergie, Vanessa Hudgens and many others came out to enjoy the sun, music, and watch & singing along to Azealia Banks, Radiohead, Rihanna, Arctic Monkeys to name a few. What better way to combine music, style, and fun. Definitely a place to be. Anywho, I'm not moved by any of these styles except Dree Hemingway (she's wearing the hot tamale cropped top and skirt set). Everybody else seems to be trying way too hard to be hippy-ish and have a 'i-don't-care-what-i'm-wearing' vibe. I will say, though, I like Katy's dress. Not just what's worn underneath the dress. Great photos! I thought about going this year, but I missed it once again. 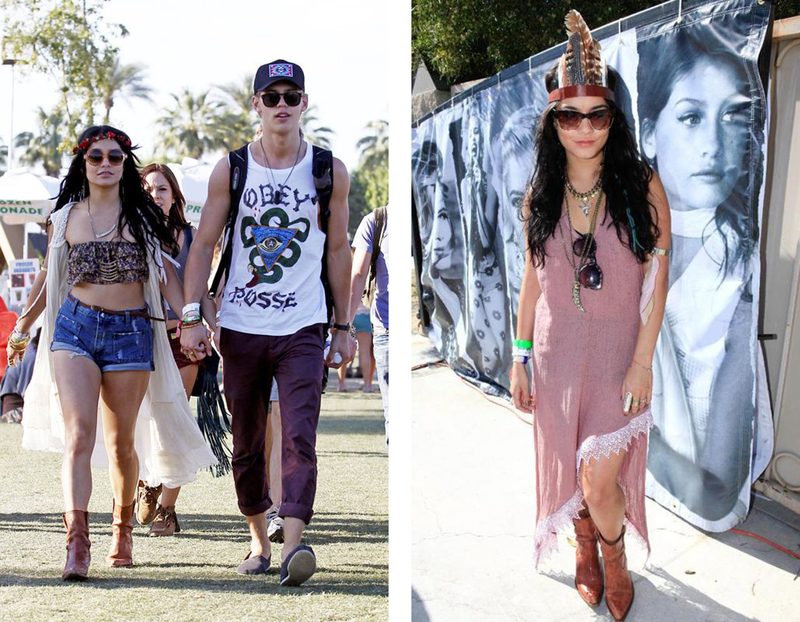 Let's vow to go to Coachella next year (why not)!? We can save for it all this year and lord knows we'd have kickass outfits. Not a fan of Katy Perry's coachella look! I love the hippie boho look its my fav! i cant wait till i go to cochealla! God I am so jealous of you ! Coachella is everywhere! When I log onto sites to go shopping there are full music festival sections! Anyway, these are great outfits, I'm so hitting up some music fests this summer. Wow... I would have lovvvve to have been in attendance!!!! Great photos... Thanks for sharing! Oh I think Coachella is amazing,I would love to be there once.Great styles! This is the festival of style! I love it! Hi lovely, thank you for your sweet comment! I’ d be very pleased if you like my blog enough to follow it and I will follow yours of course! I wish you lots of success and will surely come back often! Those shorts on Rihanna are just fierce!!!!!! She killed it!